Sometimes, I find it really hard to be an earth scientist and live in New Orleans – and not just because we don’t have any local rocks to speak of. Rather, I find myself overwhelmed as my work can inundate me with new facts and projections about the vulnerability of the place I call home. I recently co-published a paper in the journal Nature Communications where we found that the relative rate of sea level rise in this region is more than four times the global eustatic sea level rise rate! Facing such stark results, I often find myself worrying over whether I’m doing enough to deal with this issue in my professional and my personal life. As a professional, I have come to understand that there are only so many hours a day I can analyze data, or conduct lab experiments, or write about my conclusions before my brains feels as waterlogged as the wetlands I study. Personally, however, I struggle more with how to clock out from the concern I feel about the future of our coastline and our communities. That’s where I have to lean a little on my faith. I came to my faith a little later than some, so while I grew up in a Catholic household, I wasn’t really moved to learn more about my faith until I was 30 and living in New Orleans. My connection with my church home (First Grace United Methodist Church) started with the great choir, but grew when I started my involvement in a Lenten challenge to ‘Scale Back’ my consumption as a service to Creation. Since that point, I’ve worked to find my own connections between scripture​ and the preservation of the environment. Understanding that we, as Christians, are called to protect God’s Earth gives me motivation to stay in my chosen field. I am blessed to lean on God’s word for continued support as I work. When I become overwhelmed or discouraged with the enormity of the challenge facing us, I remember that I am not walking alone, and that my cup can be refilled. Faith is what makes me want to work on coastal issues, and faith is what allows me to work on coastal issues. Feel inspired? 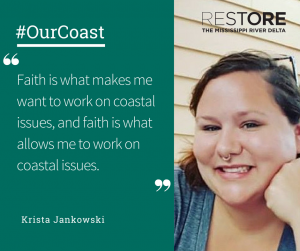 Submit your own #OurCoast story.